In June, the Institute for Environmental Negotiation (IEN) at the University of Virginia announced that Bob Dunn, immediate past chairman of VIRGINIAforever, was selected to receive the 2018 Gerald P. McCarthy Award for Leadership in Environmental Conflict Resolution. The McCarthy Award is presented annually to an individual who demonstrates leadership in preserving and protecting the Commonwealth's environment through collaboration. 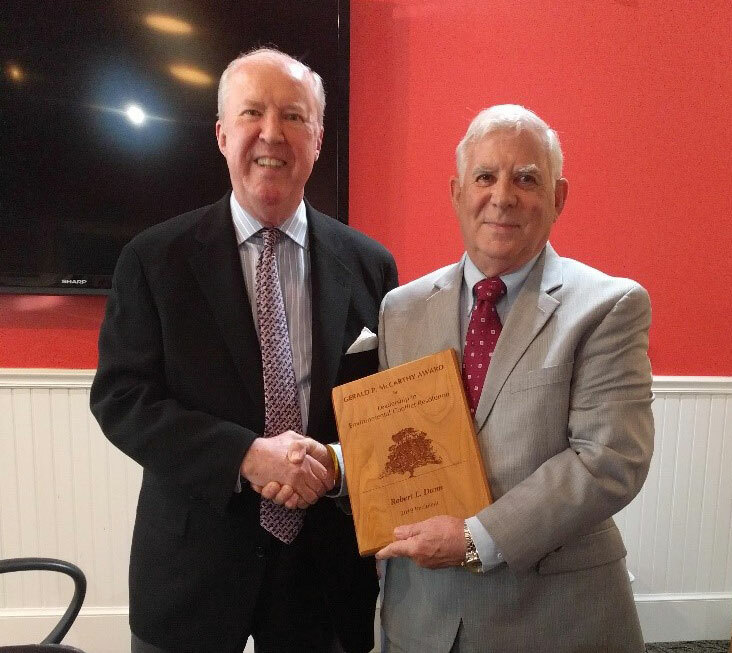 In September, the award’s namesake Jerry McCarthy made a special presentation at the VIRGINIAforever executive board meeting, where Bob accepted the award. In his remarks, Jerry noted that Bob is a dedicated, passionate proponent for natural resources protection and environmental stewardship. Throughout his career and his retirement, he established himself as a steadfast leader in consensus-driven decision making. Notably, Bob served as Environmental Affairs and Community Relations Manager for DuPont for 39 years, where he was the company’s primary liaison to the Virginia Department of Environmental Quality. During a time when the world’s largest chemical corporations were struggling with environmental compliance, Bob was instrumental in the conception and implementation of sustainability plans for the benefit of the communities where their plants operate, as well as the interests of customers, employees and shareholders. Congratulations to Bob and a special thank you to Jerry for the personal presentation. VIRGINIAforever helps you stay up-to-date with relevant news that impacts natural resources and shapes public opinion in Virginia.